So, something we don't discuss here much on Lovely is the crazy, sad, upsetting, or genuinely frustrating times in life. Take for example this scenario: you and your fiance decide to move into a rental house. You find a house you love. You love the area, the hardwood floors, the backyard, it's right in your budget, and you get your own sewing room. Lease is signed. Things are in motion. Awesome. Then, crazy landlord-t0-be decides she wants the house for herself and breaks the lease without telling anyone, including said couple trying to rent the house. Awesome. Not. Hypothetically speaking, this all happens, you're away for the week with your students, and bye-bye sewing room, backyard, dishwasher, washer and dryer, and cute area with a park within walking distance. Like I said, all hypothetically speaking, of course. Needless to say, it was a tough couple of days. Luckily, I was away with my very funny and sweet students who made me laugh the whole week. Anyway, here's the part of the story where it becomes a love story. When Eric and I moved into our current apartment, we devoted one whole room to his recording studio and instruments (it's a two bedroom place). I was more than happy to let him have his recording space, and we have a deliciously comfy couch in there that I curl up on and listen to him record. So, when we were looking at three bedroom houses, we decided I would get my own sewing room. 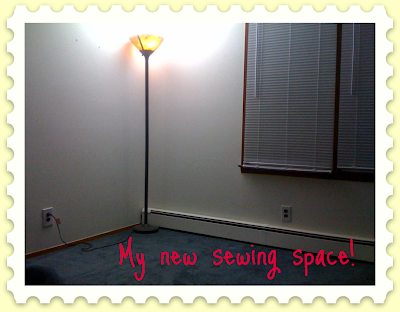 MY OWN SEWING ROOM. Yes, that deserves capital letters. A place where my machine would live and never have to be put away. A place to store my fabric and supplies. Swoon. When I found out on Tuesday that the house wouldn't be ours after all, I was sad, of course, but mostly I was disappointed that I wouldn't get my space. Well, Wednesday night, while I was in Boston watching the Red Sox in the rain, I get a text message from said Fiance telling me to check my email. He had sent a picture (see above). The subject of the email was "Sewing room." My sweet, sweet husband-to-be cleaned out one whole half of his studio so I could put in a desk and cabinet for my sewing supplies. Do you see all that wonderful space?! I was surprised and so happy that if it hadn't been raining, and I hadn't been sitting in bleachers, I would have danced like a mad-woman. I came home and went straight for my empty space. My own space. Better than coming home to dinner, or flowers, or a new CD, is coming home to a place of my own to sew. My own sewing room which I get to share with my favorite musician. Now that, my lovelies, is a real life love story.